With 2012 winding down and the start of the 2013 karting season just days away, rising star Anthony Gangi Jr. will look to continue his winning ways when he next gets back on track. The young, 11-year-old phenom had a dream 2012 season, earning two of the biggest titles in the United States. Another year in the Rotax Mini Max, TaG Cadet and Sportsman categories will likely see Gangi Jr. continue his climb in the karting ranks, as the breakout star will certainly be one of the drivers to beat in every race he enters. Starting off his 2012 season at the prestigious Florida Winter Tour (FWT), Gangi Jr. would see action in both the TaG Cadet and Rotax Mini Max categories. On track first in the beginning of January at the Palm Beach International Raceway, Gangi Jr. would start out with a solid fifth place result in Sunday's round of TaG Cadet action, running against a tough class of 35 competitors. In his Mini Max debut the following weekend, Gangi Jr. would encounter some difficulties as he looked to put his Palm Beach effort behind him and focus on the next rounds at a track he favors, the Homestead Karting Complex. Another top-five finish there in February put Gangi Jr. in the mix for the TaG Cadet championship title. In Rotax action, Gangi Jr. started with two top-ten qualifying efforts to start his weekend, as he wrapped up his Homestead campaign with tenth and 12th place finishes against the largest Mini Max field ever assembled. Closing out his 2012 FWT at the Ocala Gran Prix facility in March, Gangi Jr. would put his GT7/TonyKart on the front row for Saturday qualifying and take his maiden TaG Cadet victory in the day's main event. Coupled with a third place podium finish for the final round, Gangi Jr. was able to take third in the overall championship points battle. With one final weekend in his Rotax powered kart, Gangi Jr. went on to his best Mini Max finishes to date with sixth and ninth place results. With the FWT completed, Gangi Jr. would then turn his attention to the World Kart Association (WKA) Manufacturer's Cup series as well as the Great Lakes Sprint Series (GLSS). Focusing on the Cadet Sportsman class, the up-and-coming pilot would crisscross his way throughout the eastern half of the US as he looked to gain experience and stay fresh in the kart. Missing the first two weekends of the WKA series, Gangi Jr.'s efforts were highlighted with two top-five finishes at Concept Haulers Motor Speedway in Norway, Illinois as well as pole position at the series finale at New Castle Motorsports Park. A solid GLSS campaign saw Gangi Jr. take seventh and fifth place honors in the final Cadet Sportsman championship standings. Gangi Jr.'s major achievements in 2012 would take place in the latter portion of the season, starting with the United States Rotax Max Challenge Grand Nationals. Gangi Jr. looked to earn his second US title after taking top Rotax Micro Max honors in 2010 and he was able to do just that. After a demanding week that saw track conditions changing by the minute, the 11-year-old karter was able to rise to the top and cruise to a five second victory and the US Mini Max title. A few months later, Gangi Jr. was able to earn a $2000 payday with his second place finish at the inaugural Yamaha Junior Sportsman Money Race during the 2012 Robopong 200. Wrapping up his 2012 on track season with the biggest race of them all, the sixteenth running of the SuperKarts! USA SuperNationals in Las Vegas, Nevada, Gangi Jr. would look to hit the jackpot at the popular and glamorous event. Taking on a huge field of 68 competitors in the TaG Cadet class, Gangi Jr. would rise to the occasion to score the biggest win of his young career. Starting out with fifth in the qualifying session, Gangi Jr. would move forward in the three heat race flight format to score all three race wins. With pole position secured for Super Sunday's final, Gangi Jr. would endure a battle of the ages during the 15-lap final. Coming out on top, Gangi Jr. staked his claim as the 2012 SKUSA TaG Cadet Champion. With his US Rotax Mini Max title came the opportunity to travel to Portimao, Portugal with Team USA for the Rotax Max Challenge Grand Finals. Known as the "Olympics of Karting," qualified drivers from around the world converge for the yearly event in hopes to earn the title of Rotax World Champion. 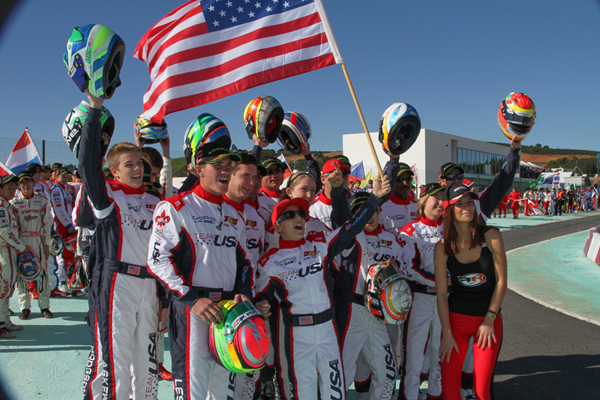 As the future of the sport and 2012 Mini Max National Champion, Gangi Jr. was invited along for the trip and took part in the opening ceremonies with the entire United States contingent along with competitors from over 60 countries. The experience will benefit Gangi Jr. should he qualify for the prestigious event once he reaches the Junior level of Rotax racing. With a stellar season completed, Gangi Jr. is already focused on his 2013 campaign, which kicks off just after Christmas for the first round of the WKA Man Cup Series. Heading to Daytona Beach to take part in Daytona KartWeek at Daytona Int'l Speedway December 27-30, Gangi Jr. will then begin his gruelling six weekends of Florida Winter Tour action January 12-13 in Palm Beach for Round #1 of the TaG weekend followed by the first Rotax weekend January 18-20. From there Gangi Jr. will head to the Homestead-Miami Speedway for Round #2 February 16-17 for the TaG classes and February 22-24 for Rotax. Gangi Jr. will then wrap up his 2013 FWT campaign at the Ocala Gran Prix March 16-17 for Round #3 of TaG and March 22-25 for Rotax. His 2012 results have certainly Gangi Jr. well within reach to continue his winning ways in 2013 and beyond.